"There is an old tale that speaks of the many mysterious creatures that inhabit such dark and murky, magical places. It is believed that just as the fog begins to rise from the viney plants, if you listen very closely, you may hear the otherworldy wail of the wild and wooly Heffalump calling for his long lost friends, the fairies to come and visit the neighboring gardens with him before the sun begins to ripen the berries for another day." portion of her site. But my sisters talk about their interests, so I guess I'll do the same. though I, too, love the sea. So I'll share with you my current wanderings..
girl and loved nothing more than to climb the cherry tree in my parents' front yard. Yes, I DO talk to trees, as my sisters will tell you. And sometimes they talk back. 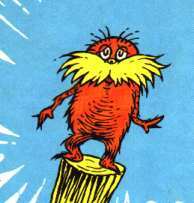 see which trees respond best to you...Meet my favorite Tree-Lover...The Lorax! Visit an interactive Edward Gorey site! A friend gave me a poster of the Gashlycrumb Tinies a long time ago, and I've been a fan ever since. If you love him, too, or if you're not familiar with his work, take a look! 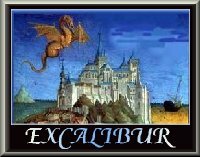 in Medieval England at all, I think you'll find these sites enjoyable. I have only read the first three on this list. The others came from a search at Amazon.com I also recommend you check your local library. site is owned by Queen Moon.